Things were going great, the sun was shining, you were having coffee with a new guy. Your hair was perfect, your lipstick stayed off your teeth all morning and your shoes were spectacular. The date went really well and it may be something that will last. It was shaping up to be the (almost) perfect day. As you walked out of the coffee shop, the supermarket parking lot where your new red Camaro is parked erupted into chaos. Paintless dent repair was the last thing you were thinking about when the chaos ensued. The whole situation started when an elderly woman’s scooter malfunctioned and became a missile. As she stepped off and opened her car, sparks flew from the rear of the scooter. It shot straight towards the guy gathering the shopping carts, sending the carts scattering across the parking lot. Continuing on, the scooter smashed into a trailer carrying gasoline and matches. (Huh?) Exploding, the trailer shot shrapnel into the air to about 15 feet high. While all of this was happening you stare in horror as your new red Camaro seemed to be a magnet for the destruction. The shopping carts formed an angry herd of steel bison, heading straight for your car. The sound was deafening, because not one wheel of any of the shopping carts rolled true. Then the impact. As the shopping carts hit the left side of the car, the scooter lands on the roof, creating a nice dent. 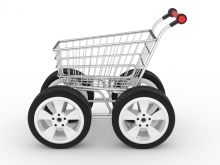 You close your eyes as the shopping carts attack. The damage resembled a hail storm and your poor Camaro needed some serious attention. Now you are definitely thinking about paintless dent repair. 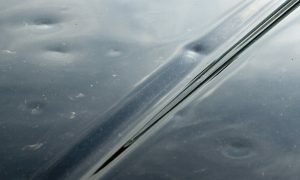 Time to call the paintless dent repair experts at DMG|PDR. Chances are nothing like this will ever happen to you but if it does, we are here for you. Call today for an estimate and get your car looking brand new again!